The simple answer is yes. But there is more than one way to approach sous vide cooking. Until recent times, only chefs were privy to the limited world of sous vide cooking. The phrase means ‘under vacuum’ in French and it’s defined as a process of first vacuum-sealing food items and placing them in a water bath. You then cook them at a lower temperature, often for a much longer time. There are certain advantages from doing this. Instead of thinking of sous vide as a complicated cooking method only for professional chefs, you can use it to your advantage in your home kitchen. I didn’t even know I could get such incredible texture in home-cooked meat until I tried sous vide cooking. So, when you’re asking What is Sous Vide, you need to remember you’ll only truly find out once you’ve used it yourself. Think of sous vide cooking as a technique for bringing food to a perfect temperature that produces the best taste, texture and flavor. And because you don’t need to constantly monitor the cooking it can be very convenient at home. There is no need to “baby-sit” your food while cooking. What is sous vide and is it healthy? So, what is sous vide apart from cooking at a low temperature? Well, let me start by saying that when you purchase your own sous vide cooker, you can realize all of the advantages that a top chef has when cooking food in a 5-star restaurant. 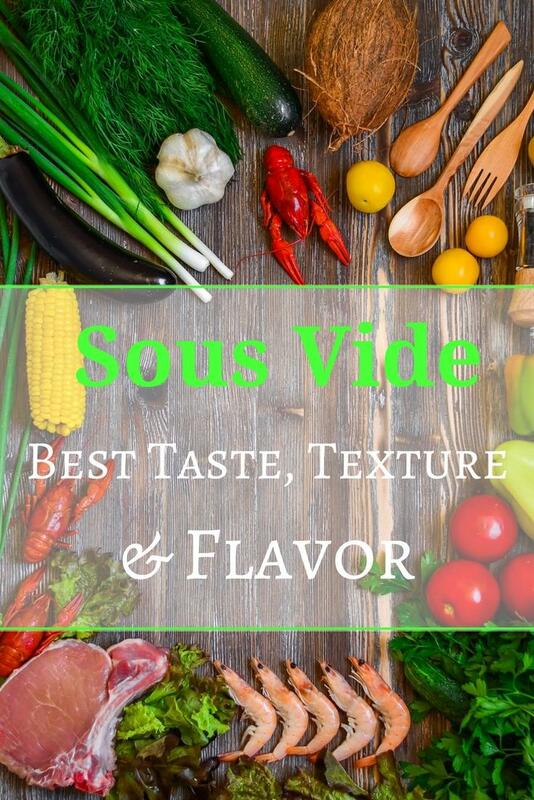 In addition to tasting like a professionally cooked meal, sous vide cooking means that you’ll be able to seal your food when cooking to retain the vitamins, minerals and other nutrients that more traditional cooking methods ruin. There is no chance of overcooking your food. This means there’s no spoiling the nutritional value. If you’re trying to eat more healthy foods, sous vide cooking is a great way to enjoy meats and vegetables and eating more of them. Another health advantage to sous vide cooking is that the technique also prevents bacteria and toxins such as acrylamide from forming. This ensures that you consume the healthiest and most nutritious meal possible. What is sous vide good for if I’m a busy working parent? Instead of dreading making dinner at the end of the day when you come home from work exhausted, sous vide lets you prepare a hands-off meal. Simply place the pockets of food in the sous vide cooker and you can sit back and relax. The result is a restaurant quality dinner without spending hours standing at the stove monitoring your cooking. This helps you eat healthy every night of the week and avoid excessive calories or fat intake from buying take-out. Because you cook in a vacuum sealed bag you can meal prep ahead of time for the week. With everything ready to go in the fridge or freezer your weekday dinners are the easiest they can be for a high quality meal. How many sous vide machines are there? There are two main options for buying a sous vide cooker (click here to see Reviews on the Top Sous Vide Cookers). You can purchase a sous vide machine which sits on your counter. This type is also referred to as a sous vide water oven because it is all-in-one and set up ready to go. The advantage of having a sous vide water oven is that you can use multiple pockets of food in it at the same time. You can cook steak and vegetables separately but all in the same sous vide appliance. The basic features to look for are size and volume. You’ll also want a timer and a digital display panel. The other option is to purchase a sous vide immersion circulator to use in your own pot or another container. These immersion circulators have become quite sophisticated. They often include sophisticated technology which makes your life easier and your meals better. A sous vide immersion circulator has the advantage of being used in your own pot so you don’t need to store any additional large appliances. As long as the pot is big enough, you can feed the whole family using an immersion circulator. to fit in your silverware drawer. Time to buy sous vide? 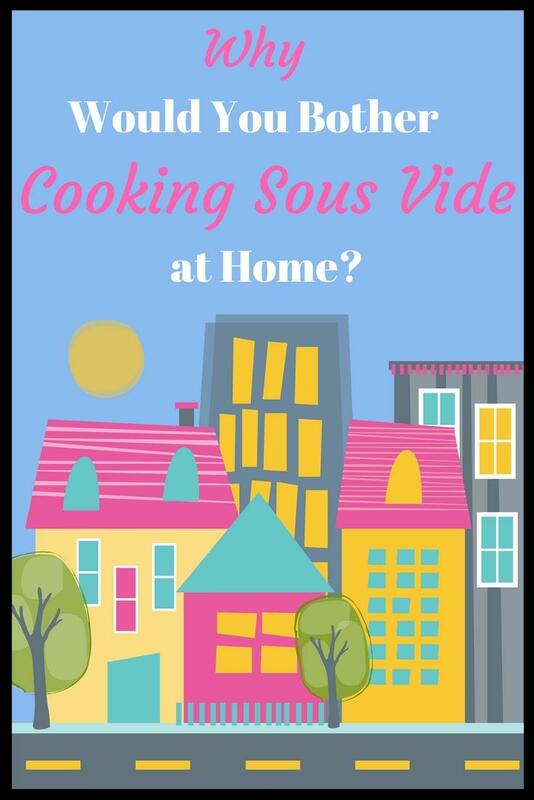 If you’re thinking about buying a sous vide cooker take a look at these reviews for some helpful information: Sous Vide Water Oven Cooker, Sous Vide Immersion Circulator. So, what is sous vide, apart from cooking in water? Don’t forget taste! When you cook sous vide the flavors infuse perfectly. This is a huge part of sous vide cooking. It distinguishes it from traditional styles of cooking food. Cooking your food at low temps in a vacuum seal ensures robust flavors from the spices, herbs and natural tastes of the food. Your friends and family will be amazed at the beautiful subtlety of flavors in your recipes. This truly is a professional result. There won’t ever be dry or burned edges to your meat or fish. You’ll also be able to cook meals with the most appealing texture possible. Cooking with a sous vide cooker is so easy and fun. Some families even buy one to save time on meal prep at dinner time each evening, yet achieve results better than going to your favorite restaurant. How do you use a sous vide cooker? 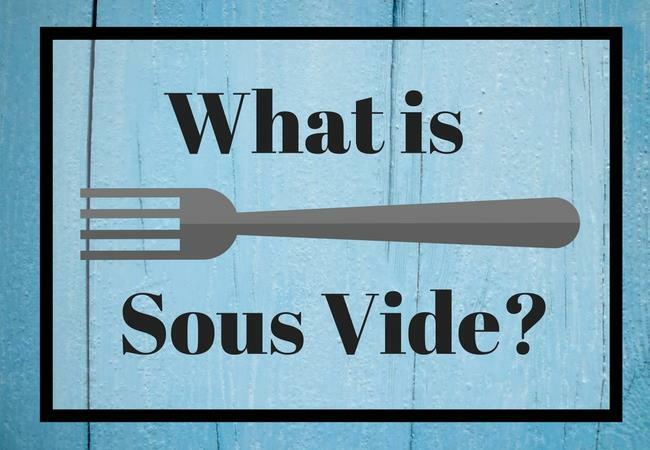 After you’ve answered the question, what is sous vide, you’ll next need to know how to use it. Learning sous vide cooking is easy and there are lots of cook books on sous vide to give you inspiration. First, you simply seal the food items in a vacuum sealer, then place it in the water bath oven and set the target time and remove the bag when time is up. You can then briefly grill or sear it or serve it as it comes out of the bag. If you’re using a sous vide immersion circulator you can simply use a ziplock bag instead of a vacuum sealer which is usually clipped onto the side of your pot. Some sous vide cookers can include a digital timer, easy-to-read LCD and a large window so you can view your food as it cooks. The sous vide cooker heats the water to an exact temperature and keeps it consistent. There are apps to control some sous vide cookers and at least one can be controlled by voice activation. With such simplicity as touching a button you can use sous vide cooking with little effort for delicious results. You don’t have to be a professional chef to take advantage of sous vide cooking. The cooker does all the work in regulating timing and heating rather than leaving it to chance. Rather than a hit and miss approach to cooking, you’ll be able to cook consistently great food each and every time you use your sous vide cooker. The advantages of sous vide cookers are many. You’ll have perfect consistency because you’re cooking at the right temperature for the correct amount of time. If you want to avoid adding fat or oil, the food will cook in its own juices, so it will be consistently moist and tender. Another benefit is less waste with a sous vide cooker because the food won’t dry out or shrivel compared to traditional cooking methods. That will result in less food being thrown out from cooking mistakes. And remember, with sous vide you don’t need to “baby sit” your food. You don’t have to stand at a kitchen counter checking the food while it cooks. Sous vide is a precise method of cooking which means it holds the correct temperature so it won’t over or under cook. This is great convenience for anyone, whether you’re a bit of an expert in the kitchen or a novice. You’ll love taking the guesswork out of cooking with sous vide. Note: this article comprises personal opinion only and should not be relied upon to form a decision. Please undertake your own research on factual accuracy and suitability before making your purchase.